Today marks the beginning of the 58th Annual San Francisco International Film Festival which has been held each spring since being founded in 1957. Interestingly, this makes the festival the longest running film festival in the Americas. The wonderful Bay Area event showcases hundreds of films with live events and numerous filmmakers in attendance to create an experience for the attendees. On April 26 at 10:00 AM PST the festival will kick off their Shorts 5: Family Films program and will include eleven films put together by some extremely talented teams. James Ford Murphy (Director) will be on-hand to present Pixar's newest musical short film, Lava, and we certainly hope Murphy will bring along his ukulele to serenade the audience with a portion of the song from the film. After the screening Murphy will greet and sign autographs for fans in attendance. You may also notice a former Pixar employee's name jump out at you as well when reviewing list of films being screened at the event. Saschka Unseld, director of The Blue Umbrella, will also be screening his latest creation, Home. The full list of short films are listed below. A few days after the screening of Lava, on April 26, James Ford Murphy and Greg Dykstra will also be presenting a Masterclass on sculpting at the Walt Disney Family Museum. 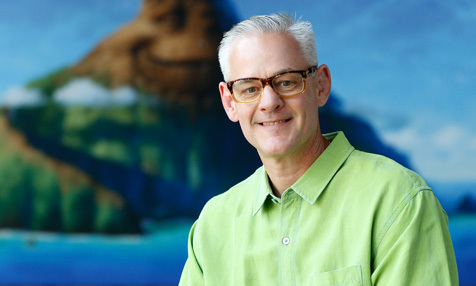 There is no question why this event is already sold out, as Murphy's passion for artwork is contagious - and we know, we were lucky enough to have had a one-on-one interview with him during the Inside Out press event we attended earlier this month at Pixar Animation Studio's. the official event description is listed below. Join Pixar Animation Studios director James Ford Murphy for a screening and discussion about his new animated short Lava. Murphy and Pixar sculptor Greg Dykstra will show how their creative collaboration helped develop the volcanic characters in the film. Using basic sculpting techniques, Murphy and Dykstra will then teach participants how to bring their own characters to life. Students will also have the opportunity to explore the Walt Disney Family Museum's galleries to find artwork from the collection to inspire their projects. Also of note, for the seventh consecutive year the festival is holding their Schools at the Festival Student Essay Contest where children have a chance to win cash prizes or the grand prize of a special screening of Inside Out at Pixar Animation Studios - that's quite an amazing prize if we do say so ourselves. If you're in the area, be sure to head to the San Francisco International Film Festival for this thrilling event (tickets available online). If you're not able to attend the 2-week long event, be sure to follow the San Francisco Film Festivals Instagram or Twitter accounts for event updates on the famed festival.